It is possible to check the alternator drive belt for tension without removing the front engine cover, although it does require you have a very long screwdriver. This method is ok for a quick check but should not replace a yearly physical inspection. The screwdriver I use for this procedure has a 10 long blade (Snap-on #ssd-1410). Im sure other brands have a screwdriver just as long, this is just what I use. I would imagine substituting a piece of 1/8 welding rod would also do. Peering across the top of the motor. 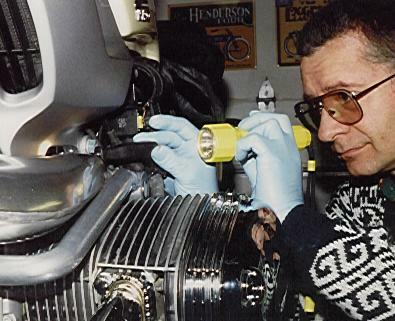 Using a small flashlight, direct the beam above the front swing arm, below the frame member and across the top of the engine. Pointing the beam a little forward, you will see the back of the alternator. Keep moving the beam forward until you see a small portion of the alternator drive belt. While keeping the flashlight beam on the drive belt, pass your screwdriver or rod across the top of the engine and press it against the belt. There should be little to no movement. If the belt feels squishy or wiggly, adjustment will be required.